The 2016 Breeders' Cup wants you to enter to win one of four fantastic, custom VIP vacations to this years event and they're even throwing in $1000 to place your wagers! A VIP Trip for the Prize winner and one (1) guest to the 2016 Breeders’ Cup taking place on November 4 & 5, 2016 at Santa Anita Park in California. Prize includes: a) round-trip economy class airfare for the winner and one (1) guest from a major airport near winner’s residence to the Los Angeles, CA area; b) three (3) nights hotel accommodations (one room, double occupancy); c) two (2) VIP seats for the Breeders’ Cup for Friday, November 4 and Saturday, November 5, 2016, including transportation to/from Santa Anita and hotel; d) the opportunity to watch morning workouts from the exclusive Trackside Breakfast Marquee; e) a private meet and greet with trainer Bob Baffert and jockey Victor Espinoza (meet and greet subject to availability; Sponsor reserves the right to substitute talent available or cancel any part of the meet and greet should any of those advertised become unavailable for any reason); f) a backside tour, hosted by Breeders’ Cup CEO Craig Fravel (subject to availability), visiting the top Breeders’ Cup contenders; g) the opportunity to meet NBC Sports talent (exact talent subject to availability); h) the opportunity to watch the Breeders’ Cup Classic from the Winner’s Circle and be there as the Champion is led into the circle for photos and celebration; and i) $1,000 wager on Breeders’ Cup Classic. The approximate retail value of the Prize is $3,977. A VIP Trip for the Prize winner and one (1) guest to the 2016 Breeders’ Cup taking place on November 4 & 5, 2016 at Santa Anita Park in California. Prize includes: a) round-trip economy class airfare for the winner and one (1) guest from a major airport near winner’s residence to the Los Angeles, CA area; b) three (3) nights hotel accommodations (one room, double occupancy); c) two (2) tickets to the exclusive Taste of the World culinary event on Thursday, November 3, 2016; d) two (2) VIP Hospitality passes to the Breeders’ Cup for Friday, November 4 and Saturday, November 5, 2016, including transportation to/from Santa Anita and hotel; e) the opportunity to tour the paddock and watch a race with Bobby Flay (meet and greet subject to availability; Sponsor reserves the right to substitute talent available or cancel any part of the meet and greet should Mr. Flay become unavailable for any reason); f) dinner on Friday night at one of Bobby Flay’s favorite restaurants; and g) $1,000 wager on Breeders’ Cup Classic. The approximate retail value of the Prize is $4,427. A VIP Trip for the Prize winner and one (1) guest to the 2016 Breeders’ Cup taking place on November 4 & 5, 2016 at Santa Anita Park in California. Prize includes: a) round-trip economy class airfare for the winner and one (1) guest from a major airport near winner’s residence to the Los Angeles, CA area; b) three (3) nights hotel accommodations (one room, double occupancy); c) two (2) admission tickets for Warner Bros. Studio Tour Hollywood for Thursday, November 3, 2016; d) two (2) tickets to the exclusive Taste of the World culinary event on Thursday, November 3, 2016; e) two (2) VIP Hospitality passes to the Trophy Lounge for Breeders’ Cup for Friday, November 4 and Saturday, November 5, 2016, including transportation to/from Santa Anita and hotel; f) the opportunity to tour the paddock and watch a race with Elizabeth Banks (subject to availability; Sponsor reserves the right to substitute talent available or cancel this portion of the prize should Ms. Banks become unavailable for any reason); g) the opportunity to walk the VIP purple carpet and have your photo taken with Elizabeth Banks on the purple carpet (subject to availability); and h) $1,000 wager on Breeders’ Cup Classic. The approximate retail value of the Prize is $4,927. A VIP Trip for the Prize winner and one (1) guest to the 2016 Breeders’ Cup taking place on November 4 & 5, 2016 at Santa Anita Park in California. 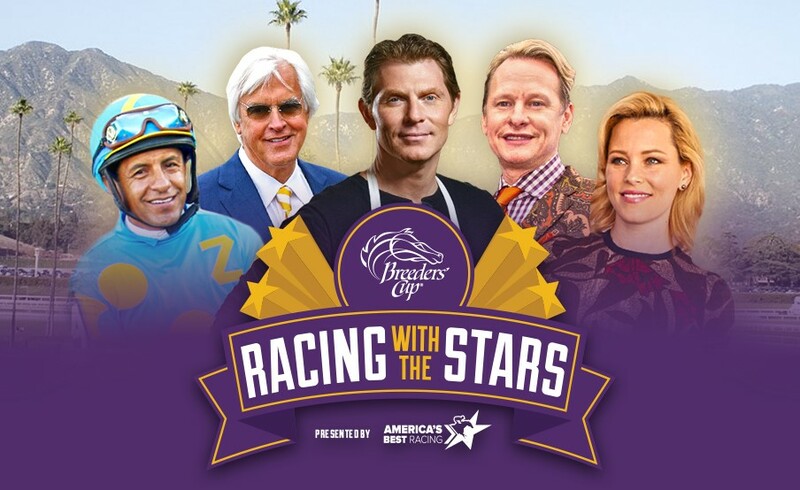 Prize includes: a) round-trip economy class airfare for the winner and one (1) guest from a major airport near winner’s residence to the Los Angeles, CA area; b) three (3) nights hotel accommodations (one room, double occupancy); c) two (2) VIP Hospitality passes to the Breeders’ Cup for Friday, November 4 and Saturday, November 5, 2016, including transportation to/from Santa Anita and hotel; d) a $1,000 shopping spree; e) the opportunity to tour the paddock and watch a race with Carson Kressley (Mr. Kressley’s attendance is subject to availability; Sponsor reserves the right to substitute talent or cancel the celebrity element of the prize should Mr. Kressley become unavailable for any reason); e) the opportunity to be a judge in the Longines Prize of Elegance Fashion Event; f) a custom designed fascinator or fedora from Breeders’ Cup Official Milliner Christine Moore; and g) $1,000 wager on Breeders’ Cup Classic. The approximate retail value of the Prize is $4,327. HINT: Technically, the rules do not state that entries are truly UNLIMITED, but you are entering once and then you can log in and complete tasks to earn points that count toward additional entries although it does not say how many you can actually earn in total. See the rules for details. This Sweepstakes ends on 10/09/16 and you can ENTER AS OFTEN AS YOU LIKE to win.